Founded in 1902 in the state of Minnesota 3M has grown into one of the major global corporations with yearly sales turnover of 34,000,000,000,000 won (some 29 billion US dollars). It has 84,198 employees working in over 70 countries around the world and its products are advanced into some 200 nations. In spite of its long history 3M is now regarded as one of the most innovative companies in the United States. 3M has so far produced a total of 64,000 products on the strength of its innovative atmosphere. Last year it was chosen as one of the most innovative corporations along with Apple and Google. It was also picked up as one of the 18 most respected companies within the states. Established in 1977, 3M Korea is now actively involved in sales and marketing as well as manufacturing of various office products and stationeries. It has many factories and research places around the nation. 3M Korea is one of the most admired companies favored by the young people to work for. It has been recently ranked 23 on the list of 30-most-favored companies chosen from a total of 12,000 foreign companies in South Korea. The growth and development of 3M Korea is spearheaded by President Jung Byung-Kook whose relentless efforts put the company ahead of many competitors in the sector. 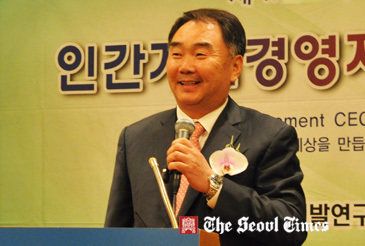 Mr. Jung became the first Korean president of 3M Korea in 35 years of its history. 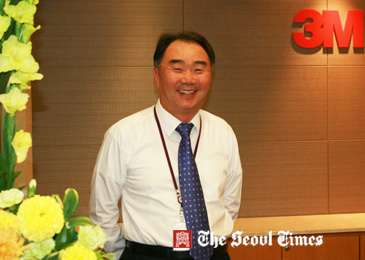 In a recent interview with The Seoul Times in his Yoido office in Seoul Mr. Jung revealed the success of 3M, 3M Korea and himself within the global company. Asked about the secrets of his success he introduced his own theory of "overflow." "As an employee I just worked hard on my assignment and I over performed it, and then my management gave me bigger assignment,"
Q1: Thank you very much President Jung for this opportunity. I was deeply impressed by your speech at KHDI forum the other day. When did you take charge as the president of 3M Korea? What have been your greatest challenges since you became the president? CEO Jung Byung-Kook of 3M Korea speaks at a breakfast forum hosted by Korea Human Resources Development Institute. A1: I was named as Managing Director and President as of June 1, 2011. Q2: What are some of the most principles of yours running your company? What are your management styles or philosophies of managing your employees and company? A2: When I run the company I make it the primary principle to satisfy stakeholders and employees through sustainable and profitable growth. I consider employee engagement as an important block for growth. To engage employees toward growth I do lots of communications in different ways and formats, and they contribute to building employees’ trust toward leadership. Q3: I believe your sector of businesses is getting more and more competitive these days as well. What are the competitive edges of your company over your rivals? Could you tell us your strategies for this? A3: We all learned very well to understand customer needs through deep customer intimacy. As we maintain customers we could succeed in the market. The more important thing is that we come to be able to meet customer needs as we have invested continuously to build R&D and manufacturing capability. Different from other rivals and players in the market 3M sustains unique way of working: to collaborate with colleagues, to imagine new ideas, and to invent new products. These eventually work for our customers to succeed and that’s why our customers visit us. Q4: When did 3M open its Korean office? How has 3M Korea been developed in the local market? How would you assess the current stature of your company? A4: 3M Korea was established in 1977 as the 48th subsidiary of 3M Company. 3M Korea exerted efforts for localization, having manufacturing plant, R&D center, sales & marketing organization established in firm and operated in Korea. This made us well prepared to serve local customers. We have grown with our customers, many of whom became global leaders such as Samsung, LG, and Hyundai. 3M Korea is perceived as a sound and exemplary foreign company, and recently 3M Korea was awarded as the 23rd Korea’s Admired Company. Q5: When was your first involvement in 3M and how? Could you tell us the difference of 3M back then and now when you are at the helm of 3M Korea? A5: I joined 3M in 1984. When I compare now and then, 3M Korea now looks like less of foreign company. We localized more products. We positioned as a partner of local customers. Beyond that we achieved 100 percent localization in terms of member of the company. No foreigner works currently within our organization. Q6: As a salaried person you climbed the ladder of success from bottom all the way to the top. I am sure that you can serve as a role model for the young Korean people. 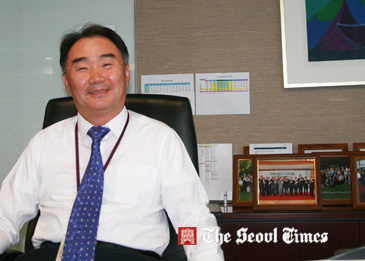 Honestly what do you think are the factors or reasons of your achievement as CEO of 3M Korea? What are the secrets of your success? A6: I realized and believe in a theory of “overflow.” In a word, if I fulfill my given responsibility with sincerity and integrity new and bigger responsibility follows, which lead workers to higher position. Q7: As CEO of 3M Korea what are your plans for its growth and development? Are there any specific things you would like to achieve no matter what during your tenure? A7: I’d like to lead a “Disruptive Innovation.” It doesn’t rely on complex process or data to develop product, rather it use insight or inspiration. As a result disruptive innovation makes development cycle fast and at the same time it makes people enjoy necessary benefit of the product. Q8: As a colossal multi- or trans-national corporation what are the contributions 3M has made for the local Korean market or its people? Could you reveal some of the pro bono activities of your company? A8: 3M Korea has sustained “corporate citizenship” as one of company values and we implemented the values through various types of community giving activities. First, “3M Science Camp” is a science education program, which has been in progress since 2002 (the 11th year in 2012). A total of 800 million won was spent for this program where 1,500 students nation-wide attended. Second is the matching-fund donation, which is the company-employee matched fund raising program. It has been carried out since 2007. A total of 500 million won has been given to NGOs. The third one is “employee volunteerism” program. We have our facilities at five different sites including Seoul, Dongtan and Hwaseong in Gyeonggi province, and Naju in South Jeolla Province. Some 113 employees spent 1,211 hours for community contribution activity in 2011 with the support of 52 million won from the company. Q9: What should be the role of companies like yours for the society and its people? When you retire from work what would you like to do for the remainder of your life? A9: When I retire, I’d like to dedicate myself to social service in order to return my experience to the society. A complete plan needs to be shaped. Beforehand I want to achieve more in business life. Q10: How do you spend your leisure time? What are your hobbies? How do you keep both your mind and body in shape? Could you introduce your family? A10: I have two sons and I love to dialogue with my family at extra time. I enjoy playing golf. The Minnesota Mining and Manufacturing Company 3M was founded in 1902. Since then 3M has extended its network across the world sticking to its corporate culture which fosters innovation and interdepartmental cooperation backed by massive research. 3M began operation in South Korea in 1977 and has been engage in the manufacture of various products and stationeries. The company has remained steadfast to growth and development through a “disruptive innovation" approach. Through this approach 3M meet the needs of potential customers, brings in transformation, and improves on sales and marketing activities. This approach has contributed to 3M’s ability and strength to push on with broader market opportunities in Asia and beyond. One of the most important policies that make 3M successful in South Korea is the fact that employees are treated as owners of the company and they are educated on leadership transformation. Management strongly believes in the notion that the comfort of employees is the best way to improve on company’s output. This is done through activities like games, tournaments, and beer parties. Much attention is given to “work and life balance.” This means employee’s daily time schedule is respected. Employees are not exhausted like in other big companies. 3M’s outstanding employee management is a pulling factor of employees from other big conglomerates. This is proven by the fact that employees from other large conglomerates constantly come to seek for jobs at 3M.These are all indications that employee-employer relationship at 3M is very strong making the company a great place to work. 3M has expanded its connection with other large conglomerates to occupy a better market position especially in the South Korean market which is very competitive, and is also a test market with very demanding customers. When products are manufactured, they are tested in South Korea before being exported to other markets. South Korea therefore offers a broad market opportunity for 3M. Encouraging the growth of small and medium size enterprises alongside conglomerates in South Korea is among the vision of 3M. The company considers this a good model that can offer more job opportunities and improve on the well-being of the society.